This article was published by ComputorEdge , issue #2718, 2009-05-01 , as a feature article, in both their PDF edition (on pages 10-17) and their website. Apple's iPhone is currently the most popular smartphone, as measured by sales, according to numerous sources. For instance, AppleInsider reports that the iPhone is outselling T-Mobile's G1 (which is based upon Google's Android platform) at a staggering ratio of six-to-one. Morgan Stanley estimates that, as of January 2009, Apple has sold approximately 1.75 million iPhone 3Gs — the latest version in the product line. The initial, non-3G version certainly got off to a fast start, when it was launched in late June 2007. During July, its first full month of sales, it outsold all other smartphones in the United States (according to iSuppli). Only 74 days after its first appearance, the one millionth unit was purchased. What accounts for this tremendous popularity, aside from the kind of brand loyalty that most companies can only dream of? The iPhone certainly boasts an impressive list of features. It possesses all of the capabilities that one will find in any of the leading smartphones: cellular phone service, as well as robust voicemail and contact management; SMS (Short Message Service) text messaging; storage and playback of music files (in MP3 format); Internet connectivity using WiFi and the 3G telecommunications standard; mobile Web browsing (using Apple's Safari browser); geolocation utilizing built-in GPS, WiFi, and coordination with cell phone towers; mapping with integrated Google Maps; language and keyboard support for multiple languages; and integration with corporate email systems using Microsoft Exchange. The iPhone goes beyond rival smartphones by featuring automatic syncing with Apple's iTunes music store. 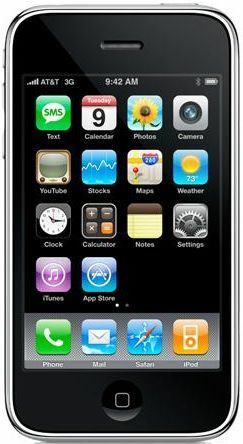 In addition to the aforesaid features, the iPhone 3G sports Apple's characteristic clean and functional design, as well as a touchscreen that allows the dynamic sizing of buttons, so the user is not restricted to mechanical buttons that consume valuable space on the unit's front panel. Another major attraction for the iPhone 3G is the extensive and growing list of applications — programs that run on the phone itself, which has its own operating system (the iPhone OS 3.0, as of this writing). There are currently thousands of such applications, in a wide range of categories, ranging from the most straight-laced business programs to the most frivolous games. Even though, within the scope of this article, I can only scratch the surface of all the available iPhone applications, there are some that have been singled out by industry pundits and consumers alike as notable and worth the price of admission, if any. As with all Apple hardware and software, the company makes every effort to maximize its control and thus its profit margins. 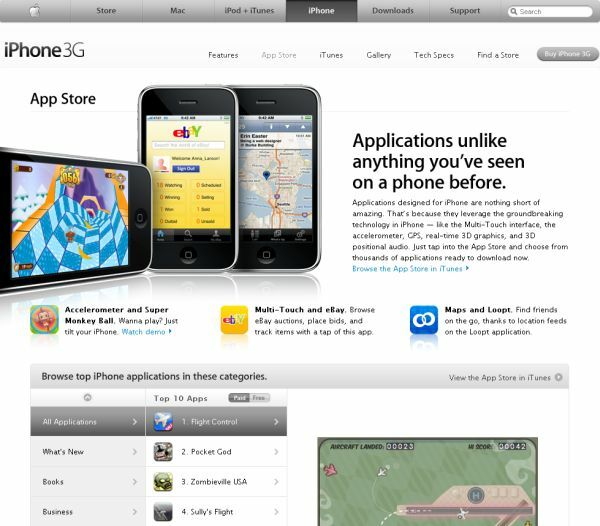 As a consequence, the only place to purchase iPhone applications is the iPhone App Store. The store website provides an overview of the available applications, and lists the most popular ones in various categories: What's New, Books, Business, Education, Entertainment, Finance, Games, Health Care & Fitness, and Lifestyle. Clicking on the link of each individual application shows you a brief preview, but no product details. In fact, to see that information for almost all iPhone apps, you have to be running Apple's iTunes on your computer. This can be quite annoying if you simply want to read those pages and learn more, before making a commitment to iTunes/iPhone, because the installation file alone is over 71 megabytes, and over 91 MB on disk. To reiterate, if you wish to see those product pages, then you will need to search by product name within iTunes running on your desktop, and not the iTunes website. The official iTunes application store is not the only source of information on products that run on this platform. Appsafari.com has information, screenshots, and user ratings for over a thousand programs. The home page shows the newest releases, another page has applications grouped into dozens of categories, and there is a page that groups them by top rated games, chat programs, utilities, iPhone mods, and finally the rather confusing title "App Store Apps". Their store page does not actually sell applications, but instead iPhone-related hardware. iPhoneApps.org, like Appsafari, discusses available applications, and also suffers from quirky navigation. The site provides brief independent reviews of some apps, as well as articles on iPhone hardware and software. Their iPhone 3G store sells various accessories, such as cases, sleeves, and other protective items. Despite these attempts at third-party sites, your best bet for browsing and purchasing applications is to go to the source, at Apple. 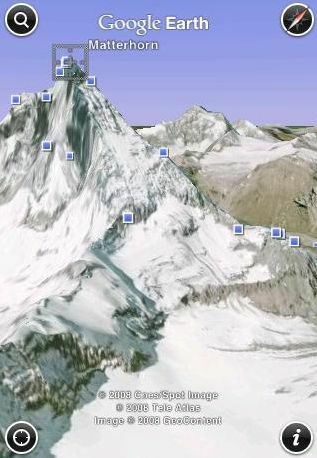 Those iPhone users who enjoy exploring the world via Google Earth will be pleased that this remarkable application has been ported to the iPhone. While the small screen of an iPhone — or any mobile phone — is far from optimal for viewing satellite and map imagery, the Google Earth app makes the most of the available space. Like its full-blown version, it is free, and includes an essential compass. Taking advantage of the iPhone's built-in accelerometer, Google Earth will tilt the horizon when you do the same to the phone itself. As noted in a Wired article on the subject, this iPhone-specific version lacks road labels, and the weakest link is the speed with which your iPhone can download the imagery and map data being streamed from the Google servers. Nonetheless, Google Earth is just as amazing on a phone as it is on a desktop computer or laptop. While the Amazon.com Kindle may be the most powerful mobile reading device, the iPhone could prove an alternative for people who do not mind reading text on a significantly smaller screen. There are several promising book applications, such as Lexcycle Stanza, which allows you to purchase any of over 50,000 new titles. You can also select from more than 50,000 free books, such as the classics of literature, offered by Project Gutenberg. 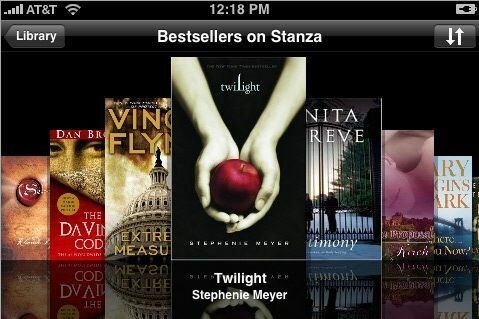 Stanza has been cited by many reviewers as one of the best iPhone apps, and during 2008 was downloaded over a million times. It is completely free to download and try out. 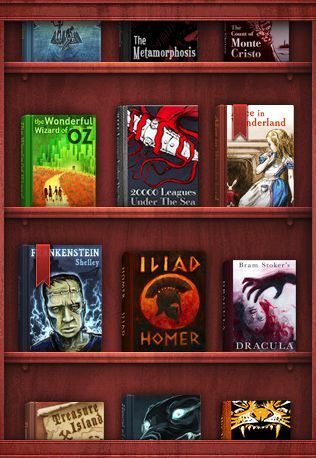 Another extremely popular book reading application is named simply Classics. It comprises 20 well-known titles from the past, ranging from Alice's Adventures in Wonderland to The Iliad . The product detail page indicates that the vendor will be adding more titles in the future. The price is currently $2.99, which is far less than what one would pay to purchase just one of the books through Amazon.com — but it is more than what you would pay to check them out from the public library. Another Internet-powered service that had transitioned to the mobile device market, is Pandora, the controversial application that allows users to find and listen to music that best matches their stated favorites — utilizing music analysis and matching done by the Music Genome Project. The Pandora Radio application for the iPhone allows you to freely create a custom stream of songs, much like an ad-free radio station. The program can display the album art and artist's biography of the music currently playing. 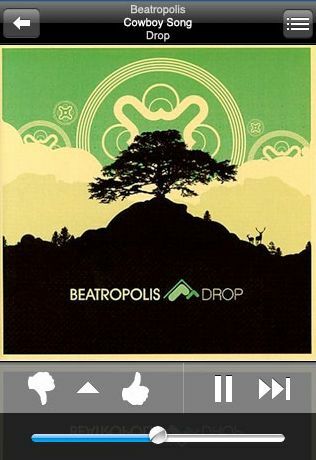 Songs can be bookmarked, and samples from them played at any time. You can even email your personalized "station" to someone else. These are just a handful of the wide range of apps that are available. The iTunes program also allows you to search for songs, albums, TV shows, music videos, and podcasts. But something may be rotten in Apple's garden of iPhone Eden. While the list of available applications in the iPhone store continues to increase, that is no guarantee that the usage of those applications is also increasing. In fact, it is possible that the download counters displayed for the most popular apps are absolutely no indication of whether iPhone users are running those programs on a daily basis, or even beyond the first few minutes of trying them out. Pinch Media, a firm that assists iPhone developers in tracking the usage of the apps they create, published a presentation titled "AppStore Secrets", which shows that, on average, only 20 percent of downloaders use any given application the next day, and far fewer continue to use it in the days that follow. One might assume that the usage rates are much higher for paid applications, but they aren't: Only 30 percent of people who paid money for an iPhone app even bother to use it the next day, and the decline in usage after that day is just as steep as for free applications. The news only gets worse. Only one percent of downloaders continue to use these apps on a long-term basis. Of course, technology buffs and electronics geeks are certainly not renowned for having excessively long attention spans. But this does not bode well for iPhone-based application usage over the long haul. It is probably a good thing that almost all of the applications listed in the iPhone store are free or only cost a few dollars, considering how poorly some of them work. In forums outside the control of the Apple empire, iPhone owners complain of a variety of problems, including navigation elements within programs not working. Undoubtedly, this is to be expected with any new technology — particularly one in which such a mix of third-party developers are cutting their teeth on their very first applications for a new platform. Yet given time, application developers will hone their skills, and iPhone users will continue to vote with their dollars and their feedback — thus improving the process for everyone involved. Thanks for your efforts on the site!